To generate observations of propagation by the Reverse Beacon Network (RBN – http://www.reversebeacon.net/), PSKReporter (https://pskreporter.info/), WSPRNet (http://www.wsprnet.org), and event logs before, during, and after the eclipse on the amateur bands for the purpose of ionospheric sounding. The 60, 30, 17, and 12 meter bands will not be used for scoring purposes because contest QSOs are not allowed there. You may earn bonus points by monitoring non-contest QSOs on these bands with automated receive nodes such as RBN receivers. The SEQP accepts CW, digital (all varieties), and phone QSOs. All transmitting and receiving equipment used to make contacts must be no more than 1 km apart. RBN and other automatic receive spotting nodes can be any distance apart. Example CW Exchange: If NØAX responds to a CQ by W1AW, NØAX receives “NØAX 579 FN31PR W1AW” and sends “W1AW 589 EM48SS NØAX”. On CW, call “CQ CQ TEST DE [your call] [your call] K” using a single code speed during the transmission. Repetition of CQ and/or TEST as shown, as well as repetition of your callsign, maximizes the ability of the automated receivers to decode and spot your transmission. Please see Getting Spotted by the RBN for tips on calling CQ during the SEQP. To find and determine your grid square, visit http://www.arrl.org/grid-squares. Digital: The preferred digital signal report is the SNR in dB as provided by the digital mode software. Alternatively, give the operator-determined RSQ (Readability - Strength - Quality) value. Note that you can enter SNR values directly into the N1MM+ Snt and Rcv signal report entry boxes directly. Researchers will assume any CW or digital signal report not in three-digit RST/RSQ format is an SNR [dB] value. Many digital mode packages such as the open-source fldigi program and Ham Radio Deluxe/Digital Master 780 have options for automatically sending spots to PSKReporter. Please enable this option to send additional data to PSKReporter. Make sure software is configured with the proper station location information. This is especially important if you are operating portably. Use an internet connection for time sync and spotting if possible. Smart phone hotspots and public WIFI may provide internet in portable locations. Use CAT control if possible. In your Cabrillo soapbox, please note the type and version number of software used e.g. WSJT-X 1.8.0. Because of the primarily one-way nature of WSPR QSOs, they should not be logged as two-way QSOs in the SEQP. WSPR reception reports will be logged on WSPRNet (wsprnet.org) and so WSPR operation during the entire SEQP period is encouraged on the usual WSPR frequencies on any band. In addition, bonuses are offered for operation of WSPR receive nodes as described in the bonus section below. You can further contribute WSPR data to the Eclipse project by recording the full data and sending it to us for post-processing. Please see https://www.scivision.co/wspr-save-raw-wav-data/ for details on saving WSPR data. We ask that upload all data related to the SEQP to the HamSCI community on zenodo.org. Once your data has been posted to Zenodo, you will be provided with a DOI (Digital Object Identifier) that you can include in your SEQP score submission to associate your data with your submitted SEQP log. Multipliers: 4-character grid squares counted once per band. Duplicate contacts on the same band and mode as a previous QSO with a station are allowed after 10 minutes have elapsed since the previous QSO with that station. The same station may be worked on all SEQP bands and modes. The final score, including bonuses, will be calculated by the HamSCI data processing team. Claimed Scores are not required to be accurate. Use the following mode codes in the log. N1MM+ should automatically generate logs with the correct codes. 6-character grid locator is preferred, but 4-character grid locator is acceptable. Include station power level, 6-character grid square, antenna type, equipment list, and extra comments in the log soapbox. Please use the example format for easy post-event processing. Use any software that supports the Solar Eclipse QSO Party. The N1MM+ contest logger natively supports the SEQP as log type "ECLIPSE". Any logging software that supports the ARRL VHF contest exchange format can also be used. Figure: "New Log in Database" dialog box from the N1MM+ contest logging program. 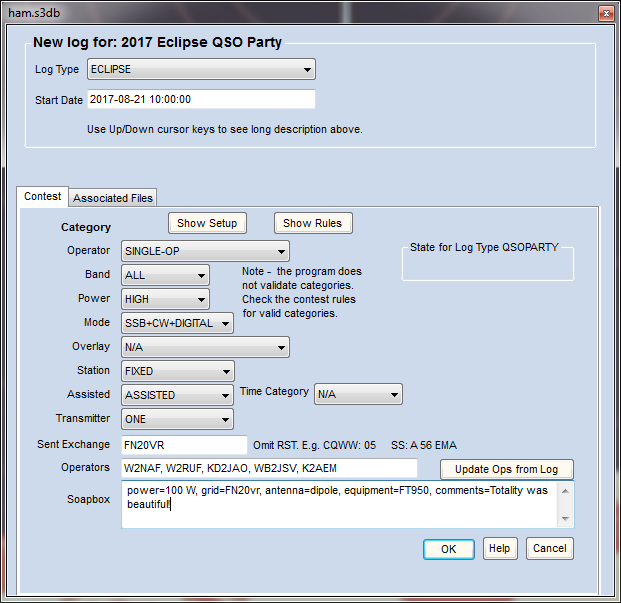 Select log type "ECLIPSE", choose "SINGLE-OP" or "MULTI-OP", put your six-character grid square in the Sent Exchange box, and include station data in the soapbox. SEQP Log submission instructions will be available at http://hamsci.org/seqp. Participants who submit through the web interface will immediately receive a downloadable PDF Certificate of Participation. Please submit logs using the Cabrillo format standard. Paper logs and non-Cabrillo logs may be converted to Cabrillo format using WA7BNM's online Cabrillo form. Cabrillo files will be used for both scoring and research purposes and is the preferred log format. Participants may alternatively submit ADIF or (other format) logs. These will not be scored but may be used for research purposes. Any additional supporting files you believe would be useful to research may be posted to the public HamSCI zenodo.org community. You will be provided a DOI (digital object identifier) you can include on the SEQP log submission page. Logs must be submitted by 2359 UTC Saturday, September 30, 2017. All bonuses will be calculated after the SEQP and included with the final scores. Operated during totality (or the time of greatest shadow at your QTH) – add 100 points. Provide ground conductivity (estimated from online conductivity maps, see https://www.fcc.gov/media/radio/m3-ground-conductivity-map) – add 50 points. Upload PDF of antenna and station design characteristics, including information such as orientation, E and H plane patterns, height above ground, station block diagram – add 100 points. Provide Effective Radiated Power relative to a Dipole (ERPD) on each band – add 50 points per band. 50 points per band and mode (including 60, 30, 17, and 12 meters). Multiple receive sites may be claimed, provided receive sites are spaced at least 100 km apart. Provide wideband I/Q recordings of SEQP bands (50 points per band). The data files should be uploaded to the HamSCI community on zenodo.org. Follow the procedures on the Eclipse HF Wideband Recording Experiment page for instructions and provide a link to these data files on the SEQP log submission page. One bonus point will be awarded for each band and clock hour during which your signal was spotted in a grid square other than your own by the RBN, PSKReporter, or DX spotting network. There are eight clock hours and 7 bands available for receiving bonus points. A spot of your signal on any mode will qualify for the bonus point. Bonus points items will be submitted and claimed via the SEQP Log Upload page. The link to this page will be posted at hamsci.org/seqp by the SEQP date.